As you survey the flooring options for an attic storage space, a kid’s playroom, an attic home office or a bedroom / living space above, you’ll want to consider the way your house is built structurally and load-bearing issues. You will also want to hire someone who understands insulation and the temperature extremes of summer heat and winter cold, plus how dry it gets in an attic before you make that flooring decision. The thickness of the plywood you use comes into play. Certain attics have joist spacing at 24 inches. Across this distance, ½-inch sheets of plywood will sag and may even break apart. With this joist spacing, you will need thicker ¾-inch plywood sheets. With joist spacing at 16 inches, the thinner ½-inch plywood may work. However, if you are building out a room for living and not just creating a storage area, we advise the sturdier ¾-inch plywood sheets as the floors may flex when people walk on the thinner ½-inch boards. Therefore, damage to the attic floor result. With any attic space, especially if members of the family will be playing, working, or living in it, you will want to consider the transmission of noise and sound through the attic floor. A quieter, softer surface can be a good buffer of footsteps, voices, and TV, music, and computer audio. Consider whether you have prefabricated trusses in place or conventional framing built from lumber. Lumber is better for load bearing. If you finish an attic, you must invite professional study of its structural capacity. Roof trusses take the weight of the roof and carry this weight down to the exterior walls of the house through their framing. As trusses are not designed for additional weight bearing, storing materials atop the trusses poses a structural danger. Even with standard lumber framing, it is advised to conduct a careful and professional study of the structure. 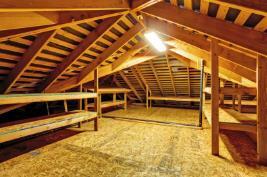 Converting only a single part of an attic space into storage space can be an answer. Choose the middle of the attic for storage because temperatures swing to greater extremes around the edges of the house near the outside. Note also that plywood flooring can compress the 10-inch or higher insulation in your attic. Typically the insulation is thicker and higher than the joists. But, we can raise the height of the joists to get full use of the insulation. Resilient flooring is needed—flooring that will act as a sound barrier to the noise of children playing above. Laminate or vinyl or linoleum over an underlayment of wood will block sound from the top attic floor from living quarters below. Also, this type of flooring is easy to keep clean. And it lasts. It comes in a variety of patterns and colors. Putting wall-to-wall carpet on top of a wood subfloor provides a softer, quieter floor, too. Kids can sit on a carpeted floor for their activities. Choose stain resistant carpet, which is the short loop kind. Wool is expensive. Polyester and Olefin are less expensive, but they attract oils and become dirty. Plus, they are hard to clean and do not last. Darker colors work best as they do not show soiling as lighter colors do. Carpet squares or tiles provide the same benefits of wall-to-wall carpeting. Such tiles come in a modular system in different patterns and colors. Plus if a tile gets soiled, it can be replaced. In this space, you may want an upgrade to the hardwood for a professional look and a durable floor. Or, you can place carpet over a sturdy subfloor. 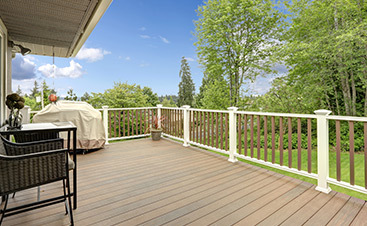 Consult with a professional about the installation of a variety of woods such as cherry, mahogany, oak, maple, hickory, walnut, pine, beech, or other woods. Hardwood gets sealed and is easy to care for. And hardwood can be refinished. Laminate which looks just like wood is an affordable option. Quality and durability are high, and a professional can install it, so it looks great. Many attics are converted to provide more living space, such as a den or bedroom. Consider suitable types of flooring for these areas. A bedroom above can look great with either hardwood or carpet. Hardwood gives an attic room an attic loft type look, and a rug can easily go over beautiful hardwood flooring. A variety of woods as listed can go in a bedroom or a great room in the attic. 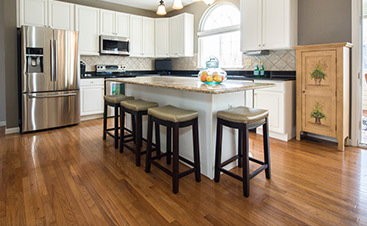 Laminate can give you the hardwood and high-end look at a much lower price. 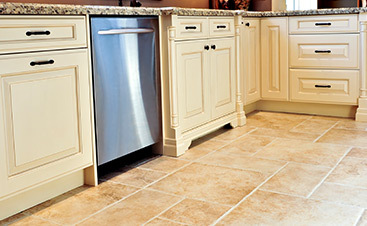 Laminates can also duplicate a tile look. Plus, they are available in a plethora of patterns and colors. What if your attic space also has a bathroom? Consider the flooring that will work in that space, too. Ceramic or other tile makes a great option for an attic bathroom floor. Tile wears very well and is durable, too. Most tiles are waterproof.